I moved to the University of Connecticut after completing my undergraduate and Master of Science degrees at the University of Cape Town, South Africa. that both climate and substrate influence the evolution of an annual life history. The genus Thesium contains ~330 species, primarily distributed throughout the old world, with a large clade of species centered in the winter, ‘Cape’ region of South Africa. These semi-parasitic plants use their haustoria (modified root organs) to obtain nutrients and carbohydrates from the roots of the plants growing around them. This may be particularly advantageous when growing in nutrient poor environments, where access to essential nutrients is limiting to growth and reproduction. In my research, I found that species with more parasitic growth forms tend to occupy more nutrient poor environments, while, in a comparison between two species, greener, leafier species are less reliant on their hosts for Carbon. Correlative analyses using both raw and phylogenetically independent (PIC) data show that divergence within the clade of Cape <em>Thesium in the degree of heterotrophy as measured using a series of traits, specifically leafiness, plant height and tissue chlorophyll and N content, reflects adaptation to edaphic environments which vary in terms of their nutritional properties. The fact that the radiation in Cape Thesium has been accompanied by morphological shifts, which are consistently associated with shifts to different environments, suggests that diversification in Thesium has been adaptive. Edaphic heterogeneity in the CFR has played a significant role in driving the morphological and taxonomic diversification of Cape Thesium. Parasitism in Thesium may thus represent a specialized foraging strategy for overcoming deficiencies in available nutrients in the nutrient poor environments of the CFR. Distributions of three focal species. 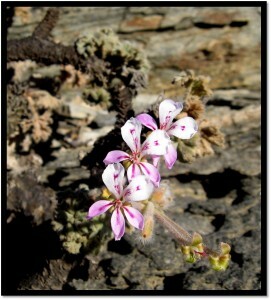 The genus Pelargonium contains approximately 280 species, and is the third largest genus in the Cape Floristic Region of South Africa . 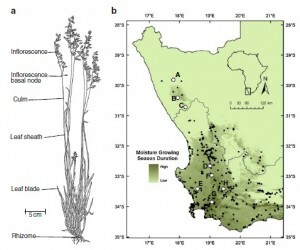 Members of the genus are represented in all major geographic regions of South Africa, but the genus appears to have radiated in the western, winter rainfall region , encompassing the Greater Cape Floristic Region (GCFR). A recent study  suggests that the rapid radiation within Pelargonium is associated with ecological differentiation along a precipitation gradient. Pelargonium includes small shrubs, stem succulents, geophytes, and annuals, and includes both evergreen and deciduous species. Pelargonium displays extraordinary leaf variation, ranging from large, entire leaves to small, finely-dissected or needle-like leaves. Species within the genus vary greatly in their geographic distributions, with some species spanning nearly the entire distribution of Pelargonium in the GCFR, while other species are known from only single locations (e.g. P. greytonense known only from the hills surrounding the Overberg town of Greyton). While variation in Pelargonium species morphology has been characterized fairly extensively [5,6], less is known about dispersal or genetic variation between populations. For my dissertation I am investigating functional morphological and genetic variation between populations of three closely related Pelargonium species: P. scabrum, P. hermanniifolium and P. citronellum. Although their precise relationships are still unclear, recent phylogenetic analyses resolve them as a monophyletic clade within the predominantly winter rainfall Section Pelargonium (Ringelberg et al. unpublished). All three species are perennial, woody subshrubs. Two, P. hermaniifolium and P. citronellum, are relatively narrowly distributed within the fynbos region of the GCFR, having no overlap in their distributions. In contrast, P. scabrum is found throughout the GCFR, from the arid northwestern corner, to the wetter, more aseasonal eastern region. Distributions of each species tend to be broken up into discrete populations, occupying environments characterized by moist, sandy soils. Level of gene flow (or ‘functional connectivity’) between populations is unknown, nor is there much information about genetic variation within and between central and peripheral populations. One possible explanation for differences in the distributions of these species is that P. scabrum possesses more genetic variation than either P. hermanniifolium or P. citronellum, allowing populations of that species to adapt to a wider range of environmental conditions. Alternatively, P. scabrum may not be any more genetically diverse, given its geographic range, but may display more adaptive plasticity in its phenotype. Distinguishing these alternatives is the focus of my dissertation, in which I will characterize population-level genetic variation among populations of these three species from across their ranges. These data will allow me to answer the following questions: i) Does the widespread P. scabrum have more genetic variation than the more narrowly distributed P. hermanniifolium and P. citronellum (on a total or per area basis)? ii) Is there more genetic connectivity between peripheral and edge populations of P. hermanniifolium and P. citronellum? iii) Does genetic diversity decline with proximity to range edges? Goldblatt P, and Manning JC. 2000. 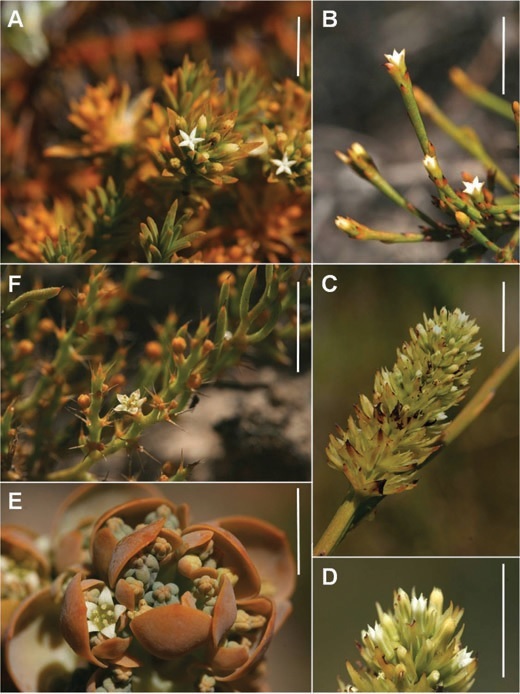 Cape Plants: A Conspectus of the Cape Flora of South Africa. Strelitzia. Epping, SA, ABC Press. Bakker, FT, Culham A, Marais EM, and Gibby M. 2005. Nested radiation in Cape Pelargonium. In: FT Bakker, LW Chartrou, B Gravendeel, and PB Pielser, (Eds). 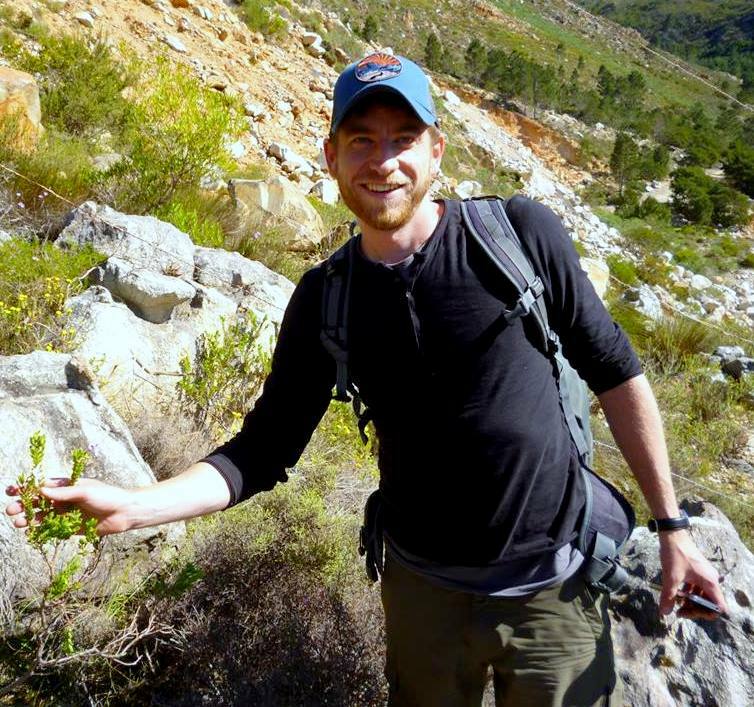 Plant species-level systematics: new perspectives on pattern and process. Liechtstein. A.R.G. Ganter Verlag K.G, Ruggell. pp.75-100. Born J, Linder HP, and Desmet P. 2007. The Greater Cape Floristic Region. Journal of Biogeography. 34(1): 147-162. Martinez-Cabrera HI, Schlichting CD, Silander JA, and Jones CS. 2012. 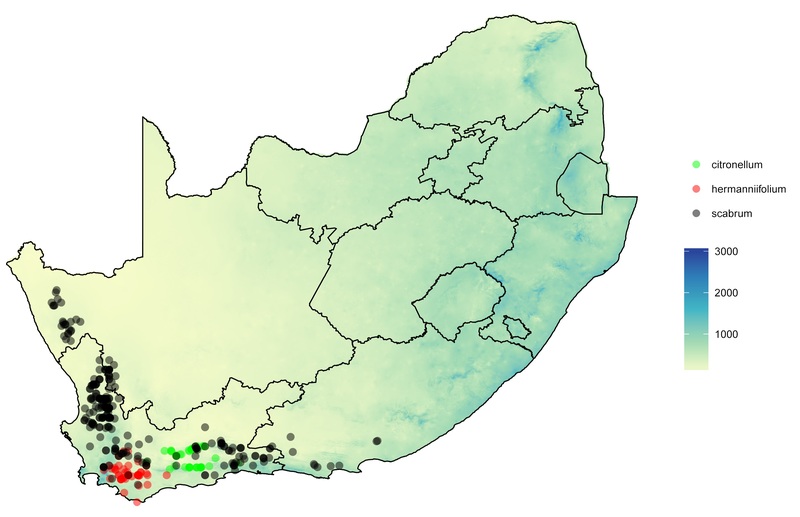 Low levels of climate niche conservatism may explain clade diversity patterns in the South African genus Pelargonium (Geraniaceae). American Journal of Botany. 99: 954-960. Jones, CS, Martínez-Cabrera HI, Nicotra AB, Mocko K, Marais EM, and Schlichting CD. 2013. Phylogenetic influences on leaf trait integration in Pelargonium (Geraniaceae): Convergence, divergence, and historical adaptation to a rapidly changing climate. American Journal of Botany. 100: 1306-1321. Jones CS, Bakker FT, Schlichting CD, and Nicotra AB. 2009. Leaf shape evolution in the South African genus Pelargonium L’ Her. (Geraniaceae). Evolution. 63: 479-497. Keitt TH, Lewis MA, and Holt RD. 2001. Allee effects, invasion pinning, and species’ borders. The American Naturalist. 157(2): 203-216.